What a great day Jenny and Jason had at the Capitol Rotunda in Santa Fe New Mexico! Her and Jason participated in the excitement of this day led by Disability Rights New Mexico (DRNM) and the NM Developmental Disabilities Planning Council. The purpose of this event was to promote and protect the rights of persons with disabilities through discussion of key legislation issues, recognition of efforts made throughout the year and to gather community resources. Driving To Independence was present with many other community providers including the state’s Division of Vocational Rehab (DVR) and the Governor’s commission on Disabilities, commission on the Deaf and Hard of Hearing, the MS Society, The ARC of NM, Department of Developmental Disabilities and Independent Living Resource Center. Jenny and Jason were pleased to meet Senator Timothy Keller in his office and were glad to share that experience with Jim Parker of the Governor’s Commission who was a leader in the fight for an Adaptive Driving Program in New Mexico. Jenny also met Representative Rhonda King as well as Representative Stapleton and Rodrigues who showed great support and encouragement for our program. Fortunately, this event and all of these introductions not only allowed us to feel like part of the disability resource community in New Mexico but it also allowed us to meet people who can assist us with some of the issues we have had while starting the New Mexico Practice. We have essentially had two large road blocks in New Mexico. One of our obstacles has been establishing a relationship and licensure with the Motor Vehicle Department (MVD) . Trying to get the MVD to be understanding, supporting and encouraging of the Adaptive Driving Program has been a slow process. Since we are so unique from the standard driver’s education programs, we have had a hard time getting help from the MVD when it comes to licensing and permitting those with disabilities. We have also had a hard time explaining the unique credential and experience of our therapist (specifically Jenny) and allowing her to practice with an out of state driver’s license. Anyway, we met we met with Jeremiah Ritchie of the Office of Governor Susana Martinez to discuss licensing and MVD issues hoping their support and assistance will allow us to streamline the always slow MVD process for our clients. We are so excited to have new contacts and support for these matters. The other huge hurdle we have had is funding resources! While we have always had a relationship (contract) with the states DVR program and the Governor’s Commission continues to be an amazing resource, we have had a hard time finding other funding resources for those who don’t qualify for DVR or who aren’t seeking employment (younger and older clients with disabilities) or who may make “too much” to qualify for assistance through the Governor’s Commission. We were happy to have made contacts at the Independent Living Resource Center and learn that they could provide funding for vehicle modifications if other resources are not available. It was a very exciting day and we were so pleased to be a part of it! On another note, Jenny was a bit surprised by the snow and was self-assured that despite her Midwest routes, she does not miss the snow. Driving To Independence is an Adaptive Driving Program servicing Arizona and New Mexico. Driving To Independence started in Tempe Arizona in 2001 and now provides services for people with disabilities and medical conditions throughout Arizona and we recently opened a branch in Albuquerque, New Mexico. Driving To Independence offers a comprehensive Driver Evaluation and Training Program. Within this program, an Occupational Therapist/Certified Driver Rehabilitation Specialist works closely with physicians, the motor vehicle department and equipment vendors to assist individuals in achieving safe driving skills. We provide services ranging from Hight Tech Driving Evaluations, Introduction to hand controls, Senior Driving Assessments and much more! 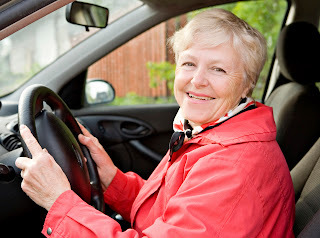 Visit our Website @ http://www.drivingtoindependence.com/ for a full list of servicse. We are all excited about our recent growth and decided that a blog would be a fun way to share our ups and downs with our clients, colleagues and friends. Through our posts we hope to educate and inspire and maybe even entertain. We look forward to feedback and questions! Juli, Molly, Jenny & Jill at the first Driving To Excel : The Race Cars were modified with Hand Controls for a fun afternoon on the track! Mobility and Independence are highly valued in our society today. The capacity to drive is crucial to a person’s ability to maintain their independence. Often driving seems like an unattainable goal for those who are limited by illness, injury or the physiological changes associated with aging. Driving To Independence offers a comprehensive Driver Evaluation and Training Program. Within this program, an Occupational Therapist/Certified Driver Rehabilitation Specialist works closely with physicians and equipment vendors to assist individuals in achieving safe driving skills. The mission of Driving To Independence is to facilitate mobility and independence in the community through safe driver skills. To meet this goal we provide comprehensive Driver Evaluation, Training, Vehicle Assessment and Recommendations specific to each driver’s needs. A Driving Assessment may be necessary following a change in medical status, physical skills or other unique situations to ensure ones safety in vehicle operation and driving performance. There are many aspects of driving that can be affected including any of the areas which we assess. Our primary concern is your SAFE independence.